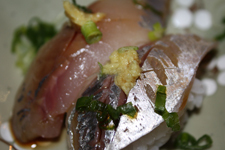 Aji is very sim­i­lar to the word for “taste” in Japan­ese, for good rea­son. Mack­er­el has a mild­ly oily but firm tex­ture. 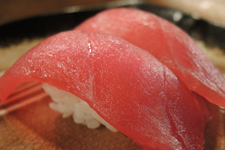 Topped with grat­ed gin­ger, green onions and ponzu. Can be served with the deep fried body by request. 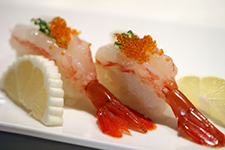 Large raw, sweet shrimp have a del­i­cate taste like white fish with a bit of a sweet bite. Their soft­ness is the per­fect match for crispy shrimp heads, served with the dish.